The last time I’d seen Walker’s work, what struck me was the size of the paintings, the thickness of the paint on the surface, and in particular the simple compositions of shapes that would be repeated over several pieces. They’d be embellished, modified, and amended, but still the same idea. Among his more common repeated motifs was an hourglass shape, supposedly in reference to the girded waist of Goya’s Duchess of Alba, and in the context of a landscape, it resembles twin lakes from a foreshortened perspective. There was also the very simple and equally powerful theme of division in Walker’s past work. It was not uncommon to see a vertical rift, and some aspect of this particular motif has been carried over into the pieces currently up on the walls of the Nielsen Gallery. 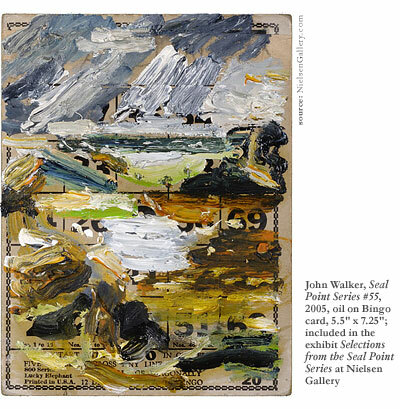 The Seal Point Series is a collection of Bingo cards, and John Walker has painted his landscapes directly onto the cardboard. There is still the same use of repeated visual patterns, as in his experimentation with what’s been referred to as the Alba shapeand in this case, the most apparent motif is an “E” shape. The handling of texture is as dynamic as ever on such a confined surface. 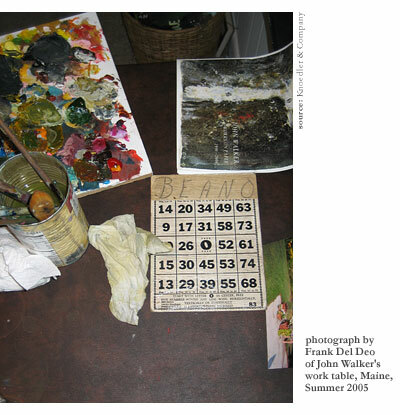 The thick pools of paint thin out to reveal the bare Bingo card, and the card has a presence almost as strong as the oil paint itself. The use of these cards as surfaces is strikingly new, and I imagine that it might raise a few anxious hands. The object of the painting is the same gestural landscape (somewhat reminiscent of Edvard Munch), with a limited palette and a heavy use of repetition. The immediate question is whether or not 5.5″ x 7.25″ is enough surface area to really execute gesture with the same flagrance as I’d seen before. So, thenwhat game is he playing with these Bingo cards? He’s stepped out of the genre. I couldn’t align the Seal Point Series with my expectations of “easel painting,” because I was concerned with more than just the oil. Here, the “canvas” (or Bingo card, as the case may be) is part of the landscape, and you can’t get that from easel painting. But at the same time, it’s not the industrial relief painting seen in Sharon Booma’s artwork, either. This is not “sculptural painting,” because the background and foreground play different roles. Booma’s material stands against a backdrop of oil paint, whereas Walker’s oil paint stands on a backdrop of material. This is something like the philosophies of site-specific earth artists. The cardboard will decay under the oil, given its organic nature, and the pieces will have a relatively short “untouched” life span before the cardboard begins to soak the paint and becomes something else. The colors will bleed and lose the vibrancy they’d have kept against gesso. As does earthen art, the Seal Point Series paintings will physically age with time. There’s a fine line between “arrested disruption” and “progress,” and the Seal Point Series suggests a sort of crossover, as if they could be the same functioncorrosion and progress, like you might see in nature. Consider the glacier that rips into the ground, creating a lake. In this case corrosion is the same as progress, and progress, in earthen art, is the sort of corrosion that makes up part of its beauty. Or consider the texture of weathered wood, or polished stone. If you take the polished stone out of the river, you’ve stopped the natural course of “disruption” that made it attractive to you. “Arrested disruption,” then, is necessarily the same as “arrested construction.” Robert Morris cites this as one of the premises of earth art. He points to the philosophy of dedifferentiation, or limitlessness. The blurring of progress and regression. Of disruption and construction. 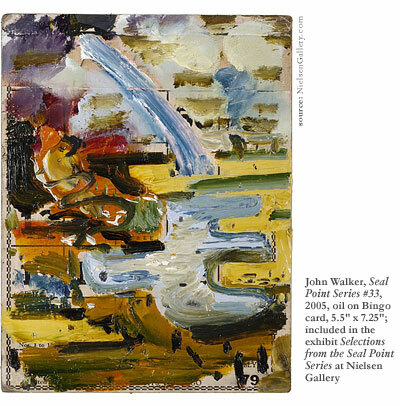 Although the Seal Point Series is in some sense not unlike earth art, the actual oil of John Walker’s painting and the aesthetic of his earlier work look a bit like a younger abstract expressionism. Think of Willem de Kooning or Adolph Gottlieb, with their big canvases and their heavy use of line and texture and simple forms. There are similarities between expressionism and earth art, specifically concerning the importance of the artist’s setting, of his specific place along the chronology of artists. I think the earth artist and the expressionist would agree that any artist is responsible always for his own dayand that it should show up in his aesthetic, and in whatever broader concerns he chooses to address in his work. And also that he shouldn’t concern himself with the past to the point that the work becomes reactionary or dated. I imagine that if you could speak to both de Kooning and Robert Smithson, this is where they’d agree. But they might disagree on how exactly that’s done. The most apparent difference between the two genres is that expressionists made time-specific paintings that last indefinitely. Earth artists make time-specific art that decays or changes. Walker’s Seal Point Series is difficult to catalogue in terms of time-specific art because the foreground is so different from the background. In fact, it seems they’re decades apart. As the Bingo cards dive into a pocket of our national memory (thereby purposefully retrograde), the actual painting is something else entirely. There is that central, repeated “E,” among other forms, which pervades most of the series and ties the paintings together along a single theme. And that theme serves as a common ground while the color, texture, and thickness of paint vary from piece to piece, in John Walker’s trademark exploration of gesture (the same sort of gesture I’d been expecting when I walked in the door, looking for mural-sized landscapes). And does the whole thing work? The question hinges on whether or not the use of such outwardly retrograde iconography, such as Bingo cards, is an act more contemporary than the Bingo cards themselves. Why are these cards ‘old’ when they’re in a shoebox, but ‘new’ when they’re on the walls of a gallery? I imagine nobody would come to look at old Bingo cards on a wall, but they’ll come to see those same cards used as a surface for something newer, and that separation forms the central conflict of the series. The surprise is in the conflictin the distance between the foreground and the background. That’s what makes Selections from the Seal Point Series such a refreshing exhibit: its ironic tribute to the reactionary. And as long as the strength of the pieces are in their tie to a specific moment in time, as long as the pieces actually become more relevant with age, this whole thing falls outside the genre of easel painting, if you’re strict in terminology. There’s an interest in just watching things change. Take out the boxes that have been sitting in your attic and sift past everything you think might be valuable. Put aside your grandmother’s wedding silverware, because underneath it is an even dustier box, filled with your own green army men, your baseball mitt, and the stone you once thought was an Indian arrowhead. And then when noting the unusual dissonance in John Walker’s Seal Point Series, consider the small things from your own past. It’s hard to ignore the gradual bleeding of time into the genre of painting. 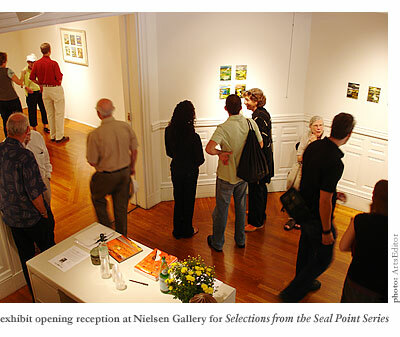 Selections from the Seal Point Series can be seen at the Nielsen Gallery on Newbury Street from September 16th through October 14th. The Nielsen Gallery, in conjunction with Knoedler & Company in New York City, is publishing a book on the exhibit.